In the words of Bjork, ‘It’s, oh, so quiet'. We’re in the heart of the Aveyron, one of France’s largest, least-populated, départements, and, we might venture, one of its most beautiful. Yet there’s hardly a soul to be seen. It’s high season, a time when the roads are choked with traffic and café tables permanently occupied by the hungry hordes. Yet Belcastel feels like a slice of France that is still relatively unspoilt by mass tourism. A fabled medieval settlement, home to some 200 residents, Belcastel sits on the tranquil banks of the river Aveyron. Its 11th-century chateau and spread of ancient houses, set on cobbled streets, nestles on the wooded slopes along the river bank. The town's humpbacked Gothic bridge, positively demands an impromptu game of Poohsticks. It’s easy to see why this has been officially voted one of the most beautiful villages in France. Just down the road, in the idyllic hamlet of the same name, Camping Fans is set within 55 acres of tranquil riverside valley meadows. This picturesque family-friendly site is the pride and joy of wonderful campsite chiefs Pieter and Marcelline Quartero. 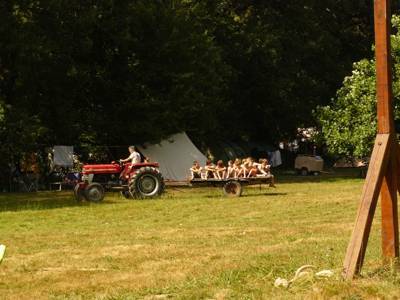 Essentially, it’s a tale of two campsites: an ‘Aire Naturelle’ site that caters to the bulk of campers, including a couple of groups in the fully-furnished glamping tents (akin to a miniature circus pavillion on a wooden deck),whileThe Secret Valley is secluded between the wooded slopes of the valley. To call the pitches spacious would be an understatement. Even in the height of the summer season, this place never feels crowded and kids can run around the place as they please. The main draw here, though, is the river. Its gently-flowing waters are safe for all children of swimming/paddling ability, and there's a small sandy beach to navigate your way in. With the summer sun in full beam, there's a steady stream of parched campers lining up to jump of the jetty into the cooling waters of the tranquil Aveyron. The river is also teeming with wildlife, from herons and coypus to trout and the sweet-tasting écrevisse (crayfish to you and me) – the perfect addition to a summer salad. There's a pleasingly lazy pace to life round here. There are no ‘animations’ for children (‘we think children are much more capable of amusing themselves than whatever we as adults may possibly come up with’) and Pieter and Marcelline pride themselves on their daily break between 12.30pm and 3pm. Fresh bread and croissants are delivered from the village boulangerie every morning in high season – the perfect accompaniment to the excellent morning coffee to be had in the communal barn. 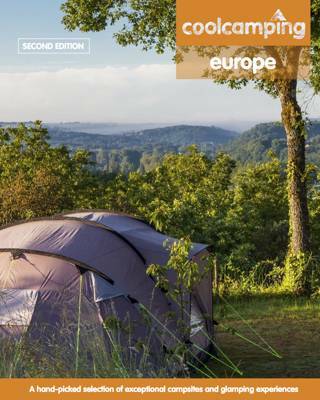 Camping Fans by name; camping fans by nature – Pieter and Marcelline know exactly what campers want out of an Aveyron holiday under canvas. And no doubt this gorgeous, unspoilt riverside site will be winning a few more fans, season after season. For latest availability and best prices for Camping Fans, please use the Date Search above. 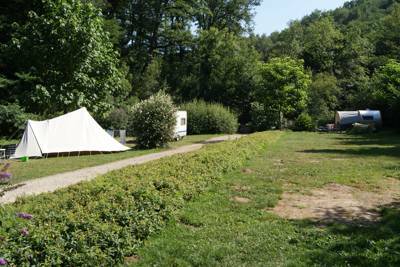 Tents, trailer tents, well-behaved groups, dogs (outside of high season) – yes. Caravans/motorhomes, campervans, dogs (in high season) – no. 33 pitches spread over adjoining 2 sites ('The Secret Valley' and the ‘Aire Naturelle’). The Secret Valley has a wash block with 1 shower, 1 sink and 2 toilets for up to 8 tents; the Aire Naturelle site has 2 showers, 4 toilets and 6 sinks for up to 25 tents. There’s no electricity in the Secret Valley but Aire Naturelle has 17 hook-ups (2 amp) and also boasts 2 fully-furnished, cotton glamping tents (each sleeping 4). Fridge and a washing machine available. Free Wi-Fi available at the café in the Small Barn. 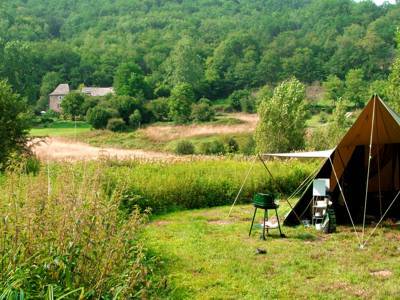 Aveyron is a dream for the outdoor enthusiast. There's canoeing just an hour from Camping Fans and plenty of great hiking routes with the Grande Randonnée 62B directly accessible from the site. Gorgeous Belcastel (officially among "the most beautiful villages in France") is just a short drive away. It's quaint cobbled streets, distinctive 15th-century stone houses and medieval castle sit on the tranquil banks of the Aveyron river. Every Friday night its marché nocturne brims with plenty of stalls for eating, drinking and good company. Villefranche de Rouergue boasts many historic buildings and its famous Thursday morning market. Enchanting old Rodez also boasts a market on Saturday morning. The atmospheric medieval village and ruined twin towers of the château inférieur at Peyrusse le Roc are an essential visit. An hour's drive away, the Tarn-side city of Albi hosts a UNESCO World Heritage Site around its cathedral and the renowned Musée Toulouse Lautrec (0033 563 494 870) in honour of its most famous son. Toulouse is just a couple of hours' drive away. Fresh bread and croissants are delivered from the village boulangerie every morning in the high season. Home-cooked hot meals are offered twice a week. There's a great little market in Rignac every Tuesday morning – perfect for basic and artisan produce. You can also order take-away pizas from the village. L'hôtel restaurant du Vieux Pont (0033 565 645 229) in Belcastel offers stunning views and an impressively refined French cuisine. For something a little less grand, Chez Anna (0033 565 639 561) serves fast food from its delightful terrace. The famous wine region of Marcillac is just 20km to the north-west of Rignac. Be sure to visit for the Sunday morning market and pick up a nice bottle of red to accompany the local specialty, tripoux (stuffed sheep's tripe). Coming from Paris on the A75 follow the signs for Clermont-Ferrand. Continue in the direction of Montpellier and leave the motorway at Sévérac le Chateau. Follow the signs to Rodez on the N88. In Rodez follow the signs for Montauban at all the roundabouts (clearly indicated on the green signposts, you are driving on the D994). After almost half an hour of driving you will arrive at a roundabout named 'Giratoire de Rignac-Centre' which is actually the first roundabout after leaving Rodez. Turn left on the D997 in the direction of Colombiès and Belcastel (do not go into Rignac). After about 5 kilometres you will arrive at Le Pont Neuf, just before the bridge you will see a small and narrow road turning sharply to the right with signposts indicating Fans and Camping de Fans. Take a wide turn to the other side of the road to enable you to make this turn. Follow this small road with the river on your left hand side for about a kilometre to the first buildings. You have arrived at the farmhouse. If you find that you have crossed the river you’ve gone too far! The nearest train stations are in Rodez and Villefranche-de-Rouergue. But as public transport is very bad in the region and taxis quite costly, you really need a car to get around – if only because the closest shops are 6 km from the site.